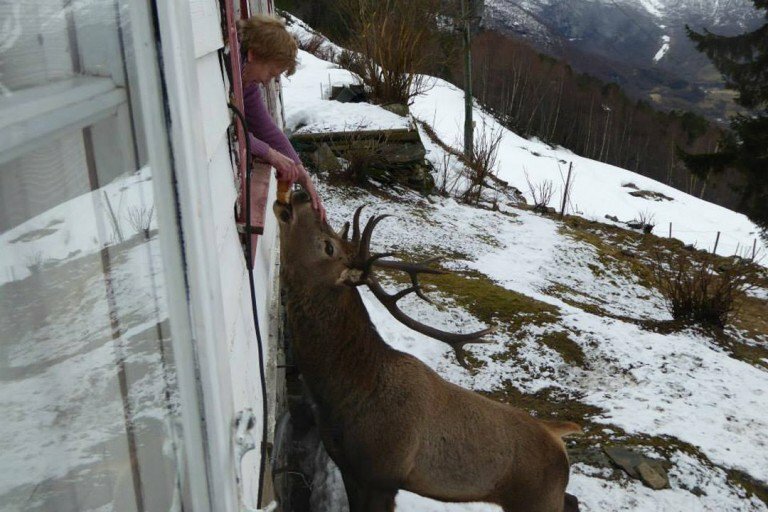 Every winter for the past three years, 80-year-old Mette Kvam, from the Norwegian town of Aurland, has been getting two daily visits from a very special friend – a majestic stag who seems to love her tasty snacks. 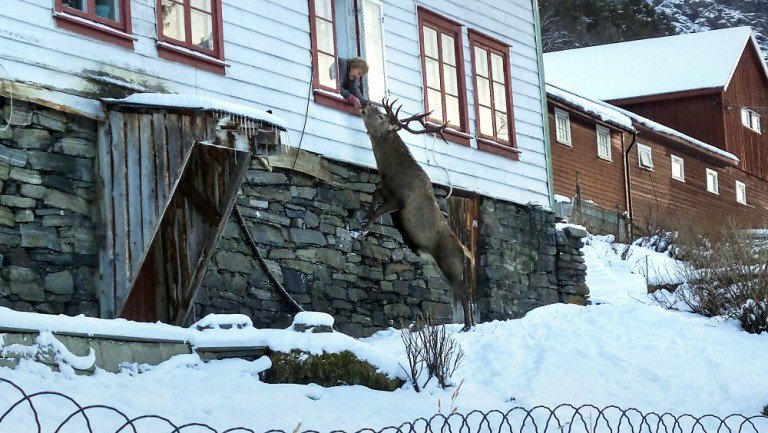 It all started three years ago, when Mette first saw her friend “Flippen” hanging out in her yard, on the edge of the nearby forest. She opened the window and offered the beautiful animal a crunchy cookie. To her surprise, the animal came closer and stretched its neck to grab the treat. Flippen must have liked it very much, because he has been coming back for more ever since. 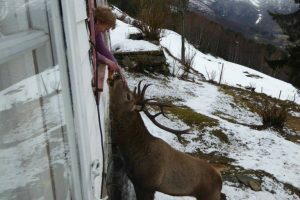 He visits Mette every morning and evening, from early November to April, when he and his deer friends head higher up into the mountains for the warm season. But as soon as they come back down, he starts coming by the woman’s house again. Mette says that her unusual friendship with Flippen has become the talk of the town in winter time, with many locals stopping by to maybe capture the magic moment when the stag leans up to her kitchen window to pick up his daily snack. Not many get the opportunity to snap a picture of Flippen during his daily visit, as he doesn’t seem to trust anyone but Metts, but local woman Britt Haugsevje Vangen recently got lucky when she and her husband spotted the animal while walking around hoping to shoot some nice winter photos. They spotted the animal from afar, but were shocked to see it approaching Mette’s house and interacting with the woman. 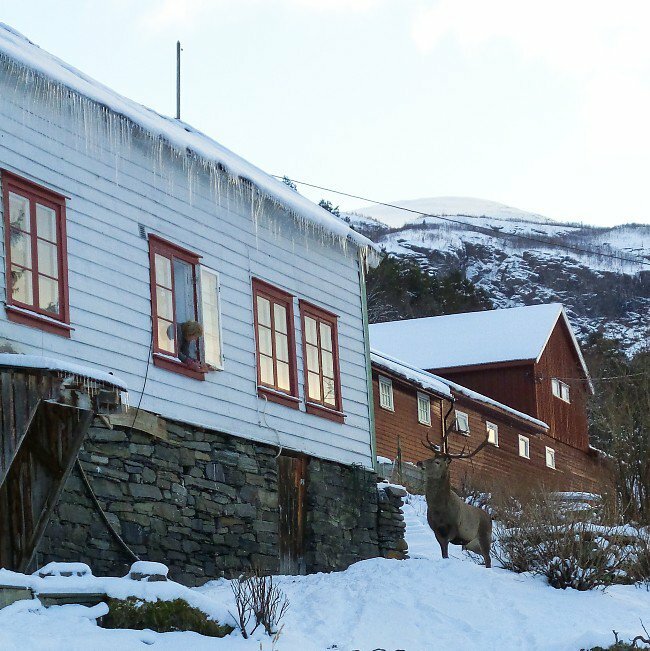 “It was very special to see, I was speechless,” said Britt, who recently shared her photos with Norwegian new site NRK. 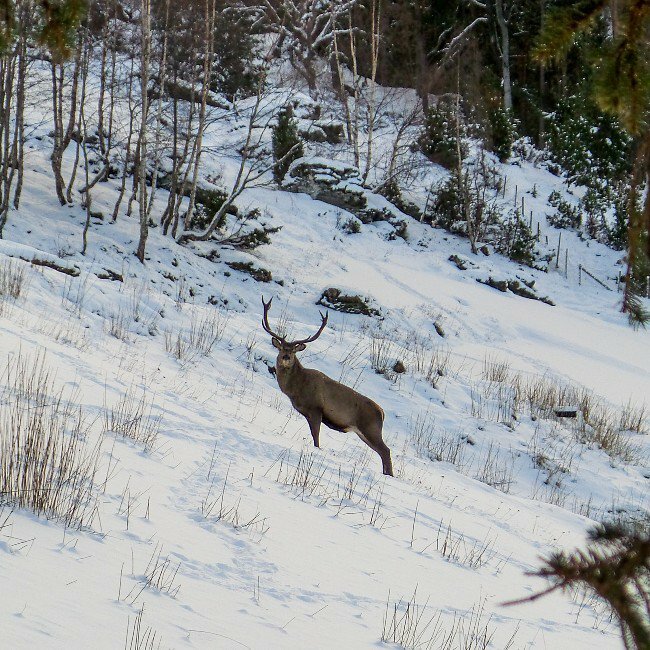 Mette told reporters that she named her stag friend Flippen because of his flipped ears. This feature has probably saved the animal’s life several times, as it helps hunters recognize him as Mette’s special friend, and avoid shooting him by mistake. In case you’re wondering what sort of snacks keep Flippen coming back every day, the 80–year-old woman say he enjoys both homemade cookies and home baked buns. As long as they come from her hand, he’ll eat them. She adds that the stag also likes being pet and scratched on the head. This story reminds me of the special relationship between a Magellanic penguin and the Brazilian man who saved his life six years ago.